The Coombe Park estate lies to the east of Kingston Hill to the south west of London. The development of the estate dates back to the 1920’s but few of the houses of this period have survived the pressure of enlargement to release the commercial potential of their sites. Eldridge London was commissioned by the owner of a post-war bungalow set in a half acre of garden amongst ancient oak trees and rhododendrons. Uniquely for Coombe Park, the owner of this property was an enthusiastic patron of contemporary architecture and encouraged the practice to design a building of its time in contrast to the predominantly faux classical villas of the neighbourhood. With the site sloping from the private road frontage down to the garden at the rear, Eldridge London’s proposal was to remodel the landscape with entrance structure at street level and living space at the lower garden level with the first floor master bedroom elevated to the level of the canopy of an existing ancient oak tree on the site. 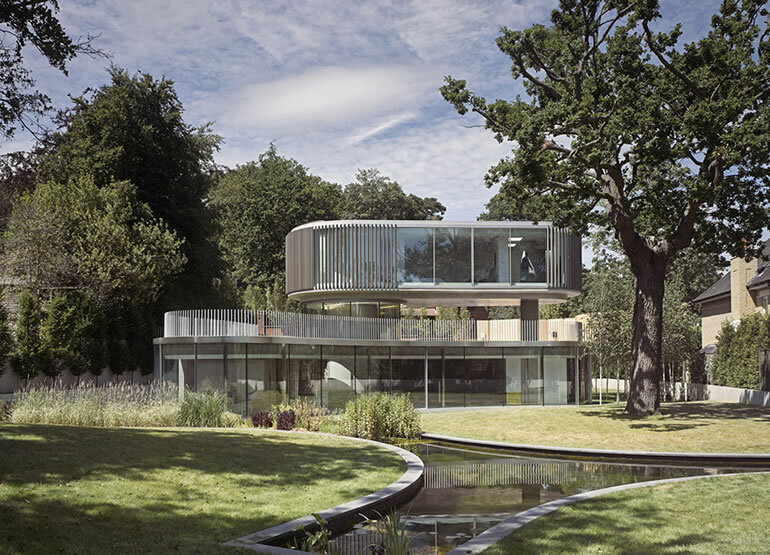 With only a glazed entrance rotunda at street level, the design allows clear views from the street through to the green landscape and woodland beyond. 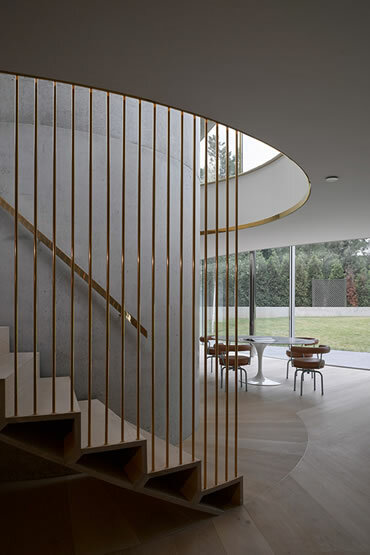 The rotunda contains a private inner staircase which links the garden level to the second floor and a winding processional stair linking the street level entrance to the living space at garden level. The roof of the garden level living space is lawn and two rooflights, one in the shape of an eye, the other a crescent let daylight and sunlight in to the depth of the lower level spaces and views from the interior to the trees and sky. 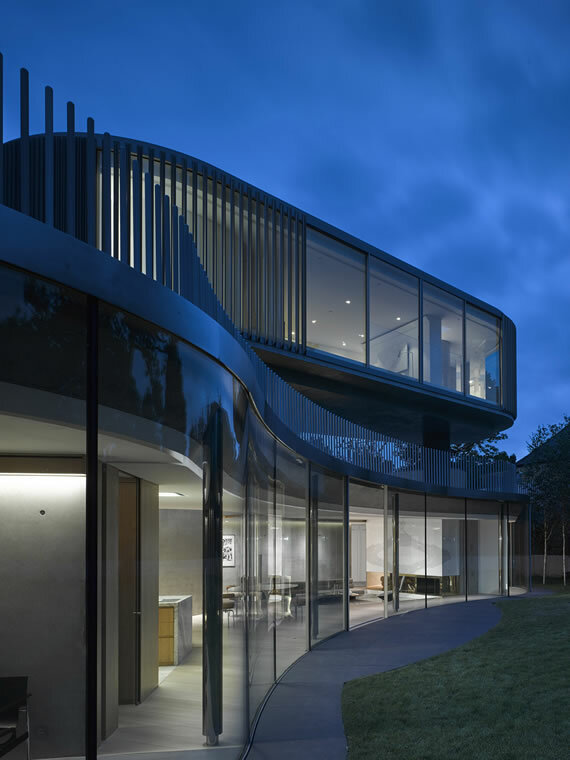 The elevated first floor is wrapped in vertical aluminium extrusions the cross sectional shape of which repeats the ‘trefoil’ shape of the garden level plan. The trefoil or three lobed geometry was generated by the rotation of an arc centred on the trunk of the ancient oak. The repetition of this geometry suited the internal planning arrangement by dividing the main garden level space into three parts, kitchen/dining, living, and media room. Beyond the central area lie three secondary spaces: a study and two bedrooms. The trefoil plan form reappears in the design of polished stainless steel door handles which are one example of many of the bespoke elements designed and crafted specifically for the house. 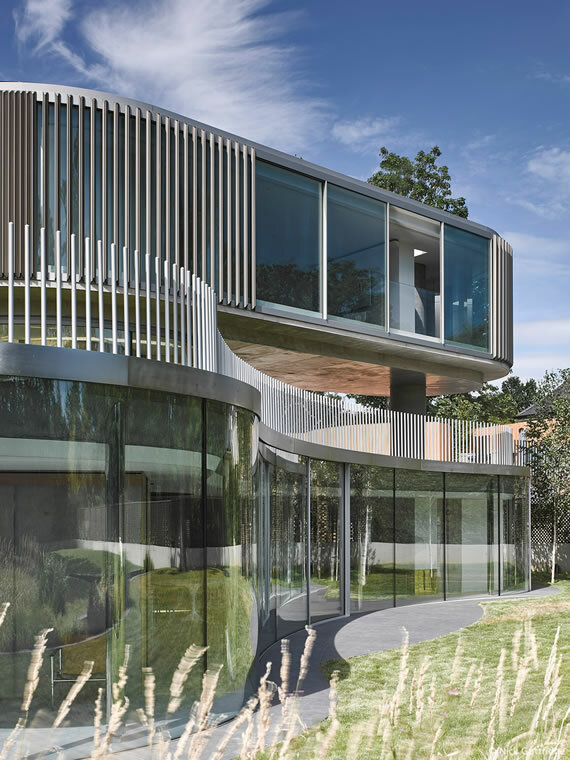 The garden façade is of curved glass with sliding curved glass doors opening up the panorama of the garden with the oak at its focal point. Eldridge London was also responsible for the design of the landscape and planting which includes a natural swimming pond also geometrically tied to the plan form of the house. 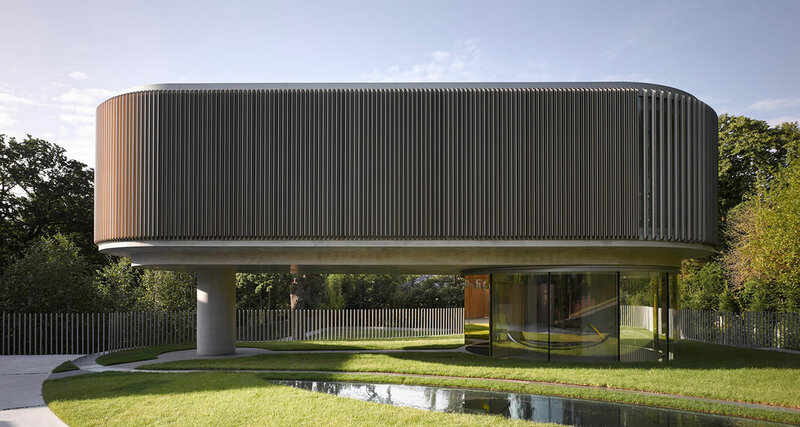 The garden is contained by a concrete wall which sweeps around its perimeter and in front of which are planted tall fastigiated hornbeams which envelop the site in a green curtain of foliage. 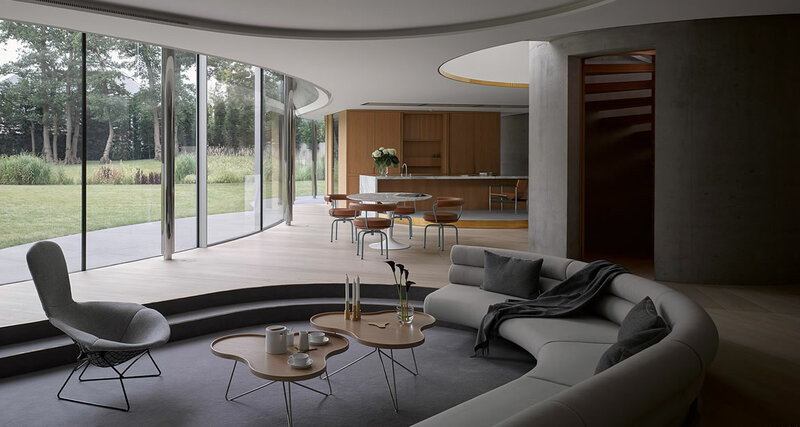 The Kingston Design review panel wholeheartedly supported the proposal, stating “this architect has created a beautiful house uniquely responding to its setting and its landscape with the most elegant spatial ordering. It lends its landscape to the setting [and] adds an architectural richness to the townscape around. This work has set a high standard of design for others to respond to.” The proposal was granted planning consent by Kingston Borough Council within eight weeks from submission of the application.